Welcome to the via ferratas in the Brenta Dolomites !!! The variety of colors, the shapes of the limestone rocks and walls are unique in the world. Pinnacles and amazing walls alternate with colorful green valleys full of forests, meadows, torrents and canyons with huge waterfalls. The dense presence of mountain lodges in the central part of the Brenta Group (one every 2/3 hours Walking) does not disturb the environment. The Northern part of the mountain chain is wilder and has many "malghe" (shelters for the cows). The number of alpinists has decreased in the last years: the alpinists or rock climbers now prefer the more comfortable crags in the valleys. The tourists prefer a short hike to the first lodge other than an adventure on the difficult paths in the Brenta Dolomites Group. Who remains on the rock walls are only the lovers of vie ferrate because here is their Kingdom. The layer conformation of the rocks permits the access to the many ledges they cut the big walls transversely. On these ledges run the Sentiero delle Bocchette, from one pass to another and from hut to hut, across the entire Brenta Dolomites. This proposal is meant for those who are not able to match their dates with our calendar dates of the via ferrata Bocchette due to work or school holidays. Sometimes we are receiving requests from people who would like to book excursions without other participants (just in 2 people with their partner or a friend) or with special requirements regarding the program of the trekking tour. The program of the personal trekking is the same as the normal program of the Bocchette trail (3 or 5 days, please see below) with the option to changes upon request of the customer. - the rent of the necessary technical gear (helmet - harness - via ferrata set). Excluded: food and drinks in the mountain lodges (calculate 45 Euro per person per day, if you do not drink too much), excluded fares for cableways. 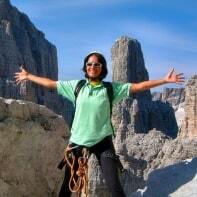 Three days holidays in the Italian Alps Europe by Mountaineering Guides Arco Trentino. Four days advanced course in the Brenta Group on the famous via ferrata delle Bocchette with overnight stay in mountain lodge Trentino. Alpine School Arco Lake Garda suggest the crossing of Dolomites Alps on the via ferrata Bocchette. 3 or 5 days hut to hut across beautiful multicolor walls with overnight stay in the mountain lodges. Everyone who visits the Brenta Dolomites must have some mountaineering and trekking experience, a firm step and a good physical condition are prerequisites. The Sentiero delle Bocchette is completely different to the "sports" routes in the valleys. This is why we speak of real mountaineering. In many parts of the routes the cable is not present (impossible to anchor on the rocks) therefore it some rock climbing experience is necessary. Sometimes the use of the rope is indispensable, especially at the beginning of the season, to belay crossing of grooves or frozen sections. The proposal of the Alpine mountaineering School Arco consists of the Crossing of West Dolomites from North to the South. In 5 or 3 days, on the vie ferrate Bocchette with overnight stay in the mountain lodges. Day 1 - Our meeting point is in Madonna di Campiglio (or in the vicinity). We drive to the starting point in Vallesinella (1.513 m) and here we can leave our car on the parking lot. From Vallesinella we climb up a steep mountain path passing Rifugio Casinei further on up to Rifugio Tuckett (2.270 m). As we are spending our first night here, it is comfortable for us to deposit some of our gear at the mountain hut, things which are not necessary to be taken on our today's trip. After a lunch break we ascent to Bocca di Tuckett (2.648 m) over a snow slope with sometimes icy segments. In this case we might have to wear our crampons to facilitate the climb up. Once we have reached Bocca di Tuckett, we turn North and partially proceed on some of the many iron ladders of Sentiero Benini (initial part). After a short break on a plateau we descend along the airy and exposed paths of the Sentiero Dallagiacoma towards Rifugio Tuckett. We are will spend our first night here. Walking time: about 6/7 hours from Vallesinella, considering breaks and slow pace (depending on the fitness of the participants and weather conditions). Day 2 - Departure in the morning from Rifugio Tuckett. We will traverse narrow mountain trails, some are equipped with iron ropes and others are not and finally we will reach the starting point of Sentiero Sosat (an alternative trail from here could be the rote Bochette Alte but this type of route requires more mountaineering experience and the use of crampons is necessary). The route Sosat is easy and scenic with extraordinary views over the Adamello Glacier Park. As the via ferrata has just been renovated recently, the only difficulty which used to be the famous vertical ladder of 30 metres. The longest of this area, is now no longer in use and has been replaced by iron pegs on the side of the ladder which have to be climbed up. In any case our mountain guides have the possibility to belay the participants on his rope. After about a 5/6 hours walk, we reach the Rifugio Alimonta. Here we are spending our second night. Day 3 - Early rise and start from Rifugio Alimonta. We ascent the Vedretta (small glacier above the Rifugio Alimonta and sometimes the use of crampons is necessary) to the Bocchetta degli Armi. Here is the start of the route Via ferrata Bocchette centrali which is one of the most famous and popular of the Alps. To start with there are a series of short and vertical ladders and we will cross spectacularly narrow but yet comfortable ledges. Following will continue crossing some channels which are often covered by snow. Later on downwards to the famous pillar "Campanile basso" and continue horizontally on the ledges which run along the vally to the Bocca di Brenta which is known as the heart of the Dolomites. Enjoying the landscape on breathtaking ledges we finally reach the Rifugio Pedrotti alla Tosa. Here we are spending our third night. - Duration of the trip: about 5/6 hours. Please note: the Bocchette Centrali are not continuously equipped with iron cables and sometimes we have to climb belayed on the rope. Day 4 - From Rifugio Pedrotti we are starting out on the initial part of Sentiero Palmieri. Further on we will climb up in the direction of the gigantic rock pillar of Cima Tosa to the chimney which is the starting point of "Via normale alla cima Tosa". After an approximately two hours walk we will take a short rest on a very panoramic shoulder a balcony over the territory. Here begins our next Sentiero Brentari. We proceed on horizontal ledges, later on climbing downwards followed by a short but slightly difficult climb to Vedretta d' Ambiez (the longest perenniel glacier in the Dolomites Group). Having finished the route, we put on our crampons and descend slowly crossing Vedretta d' Ambiez to Rifugio Agostini. Here we are spending our fourth and last night. - Duration of the trip: about 6 hours. Day 1st - We meet in Madonna di Campiglio or in the vicinity and then we drive to the starting point of our trip which is Vallesinella (1.513 m). After a lunch break we ascent to Bocca di Tuckett (2.648 m) over a snow slope with sometimes icy segments. In this case we might have to wear our crampons to facilitate the climb up. Once we have reached Bocca di Tuckett, we turn North and partially proceed on some of the many iron ladders of via ferrata Benini (initial part). After a short break on a plateau we descend along the airy and exposed paths of "Sentiero Dallagiacoma" towards Rifugio Tuckett. We are will spend our first night here. Walking time: about 6/7 hours from Vallesinella, considering breaks and slow pace (depending on the fitness of the participants and weather conditions). Day 2nd - Departure in the morning from Rifugio Tuckett traversing narrow mountain paths some equipped with iron ropes leading us to the starting point of via ferrata "Sentiero Sosat". Mountain lodge Tuckett is also the starting point for an alternative trail which is the trip on "Bochette Alte". For this kind of excursion however, much more mountaineering experience and use of crampons are necessary. Via ferrata Sosat is easy and scenic, yet challenging and with stunning breathtaking views over the entire West Dolomites and Adamello Glacier. As this track has been renovated just recently, the only difficulty which used to be the famous vertical ladder of 30 meters, can now no longer be used. It has been replaced by iron pegs on the side of the ladder which have to be climbed up. Our mountain guides will belay those on the rope who are feeling uneasy. We continue our climb on airy mountain paths partially equipped with short iron ladders. 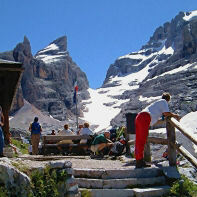 At Rifugio Brentei (2.182 m) we will have a lunch break. Crossing meadows, passing by famous rock pillars, we will reach an almost vertical alpine mountain path which is equipped with iron cables. Before we reach Rifugio Pedrotti (2.491 m) we will have to ascend a quite steep snowfield. At Rifugio Pedrotti we will spend our second night. Total walking time ca. 6 hours (depending on the fitness of the participants and weather conditions). Day 3rd - After the night on Rifugio Pedrotti we climb up to Bocca di Brenta (2.552 m) which is called the Heart of the Dolomites and down to the starting point of the via ferrata Bocchette Centrali. The Bocchette Centrali trail is one of the most beautiful and most famous ones in the area. The characteristic airy and narrow ledges are leading us to the Bocchetta of Campanile Basso and will grant us breathtaking views of the famous pillar of Campanile Basso which is the ambition of many rock climbers. We have to master exposed paths which are only partially equipped with iron cables. The non equipped segments have to be managed by easy but exposed rock climbing. In early summer some of the channels and iron cables on the routrs are still covered with snow and ice thus making the crossing more difficult. In this case the use of ice-axe and rope is necessary. 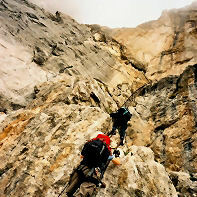 After the most difficult parts, we are then hiking on well equipped ledges and have to climb some more iron ladders before we reach Bocca degli Armi and the small glacier Vedretta degli Sfulmini. By the time we are getting there, the descend over the glacier is usually easy as the sun has melted the snow by then and after a short hike we will reach Rifugio Alimonta (2.580 m). After a lunch break on the mountain hut, we start descending to Vallesinella on easy mountaineering trails. Walking time: ca. 7/8 hrs. (depending on the condition and fitness of the participants and weather). End of our 3 day via ferrata trip on the Bocchette di Brenta ! When: whenever you want, provided during the week (no week-end) and with reservations 30 days before the date of departure (We have to book the mountain lodge). How many participants: minimum three, maximum four, possibility with same skills and mountaineering experience. The price includes the rental of technical gear. Excluding: food and drinks in the mountain lodges (calculate 45 Euro per person per day, if you do not drink too much), excluded fares for cableways or any other personal extras. What to bring with you: all the technical equipment is being provided by our Mountaineering School Arco (helmet, harness, crampons, rope, etc.). You just need to bring a pair of solid mountaineering boots. Regarding the remaining mountaineering equipment such as clothing, we will provide you with a list after the reservation. How to book or request further information: only by e-mail at least thirty days before the start of the trip. Walking Dolomites easy . Easy hiking trips in Trentino . Alpine mountaineering in Italy . Via ferrata Marmolada Western crest . Partners accommodation weather . Mountain lodges (Rifugi alpini) . Holiday week Lake Garda . Outdoor incentives team building . Mountain Lodge Association . Snowshoeing trips Alps . Guided Hiking in Greece .